We are working on stripping the paint in our living room. It’s a project that will probably last into the spring. I’ve been dreaming about paint colors and furniture for months. I found this photo over at Bliss by photographer Joanna Henderson. I love the stripes on the chair, the old rug against the wood floors, and the creamy greenish gray paint color on the cabinet. Perfect for my house. I’m so happy to share my friend Heidi’s lovely living room wallpaper. Heidi lives just down the street from me in an old house too. 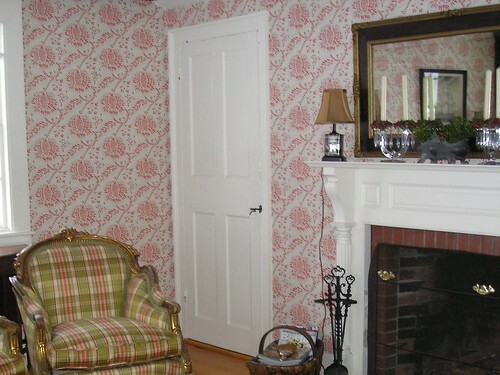 Her house is adorable filled with old house nooks and beautiful wallpaper. The wallpaper in her living room is my favorite. A great pattern with a little pop of color. This afternoon, I came across the source of Heidi’s adorable wallpaper (thanks jennifer condon!) My first thought, I can have her wallpaper too? You can see the print as well as few other very historic new england designs at waterhousewallhangings.com. Above a photo of her living room perfectly decorated to fit the small space. How gorgeous are her floors? Below the wallpaper in a reverse colorway. Check out waterhousewallhangings.com for purchasing information. Do you have an old home you would like to share? Send me an e-mail at elliott.katy@gmail.com.